Beautiful music comes from the depth of crisis. Following the end of a six year relationship, singer-songwriter Miles Hardt, was forced to brave his own emotional woes and faced a long, uphill road to sobriety. With substance abuse running in his family, witnessing deaths throughout his life, Hardt was narrowly consumed with fear, but creation saved him. "Oxygen" is the product of pouring your ragged soul into something new and pure. Reaching keys and a smart use of electronic elements dissect Hardt's heartache. The music is as bold as it is self-aware, with yearning tinging the vocal delivery. Gasping for air and looking to be a source of comfort, "Oxygen" is obsessed with presenting and unpacking dichotomies. Hardt's range and breadth of deliveries keeps the track from drowning in sentiment and falling into the trappings of a bemoaning love song. Miles Hardt is emerging from his darkness, and his journey is one to follow. Of the track, Hardt says: "Throughout the six years I was with the love of my life, I had written a lot of songs she never got to hear. I think at the time I didn't believe they were good enough. This is the last one I wrote while we were still us. The hopeless romantic in me loves the idea of it showing up in a playlist somewhere. I wrote the hook before the break up, and the verses after. It makes for this honest love song. It takes you away for a minute when you listen to it and I love that about it. It was a really important song for me while I was healing, and hopefully it can be that same refuge for someone else." "Oxygen" is Miles Hardt's second single of 2018, as he leads up to a full EP release later this year. My newest single Oxygen is OUT NOW! I woke up to find that it landed on Apple Music's "Breaking Pop" playlist among many artists I look up to and am continuously inspired by. Thank you for listening and supporting this song with me. Help me live out my dreams and TOUR EUROPE! I have been wrestling for a while with asking for help. I have done so much on my own creating writing and producing the music. Sometimes in life, I think it's important to be vulnerable and ask for help if it's for something you truly believe in. I have an opportunity to tour Europe and share my music and I am doing it fully independently so I can spread the music and message I believe in.I'll be using the money I raise to help me do that. Reach the people it was intended for. I love you all so much. Thank you for supporting and believing in me! Miles Hardt releases his first single of 2018 'Runaway"
Talented indie singer/songwriter Miles Hardt once again explores the inner works of his own past experiences and showcases an amazing understanding of the whole concept of what a human is. With his latest single “Runaway” we see something rare in the music scene nowadays, a song that actually speaks of the mistakes made and owns them. He understands that mistakes have been made by him throughout his life and does not want to hide himself behind a fantasy of impossible perfection. Instead he embraces each error and allows them to become part of his adventure in life, he accepts them and grows from them. Because making a few mistakes are necessary at times to become a better version of who you are as you get a step closer to who you are meant to be. Of course is not only about making mistakes and saying “Yes, that was me”, but also about asking for forgiveness from those who were hurt by our mistakes and our stupidity. I thank him for a song like this one, for it is needed specially now when some people believe they deserve things no matter what the cost is and that as long as you get it, who you hurt and what you do does not matter. So thank you Miles, and to you reading enjoy this must listen gem. Finding hidden gems is undoubtedly one of the greatest parts of my job; whether I’m being pitched tracks or finding them on Soundcloud myself, the end result is the same: me dancing like a fool in my room. The latest track to make me act a fool is Miles Hardt’s new song “Dizzy.” The production is simple, but effective, placing a distinctive groove and rhythm in your speakers. That funky bass guitar riff is also tasty as hell. But the real gem of the track is truly Hardt’s vocals; those dulcet tones are addictive in all the right ways and I never want the track to end. There’s no “drop” in the traditional EDM sense, but you can’t deny that epic groove. Check out “Dizzy” below. Tune in to Dash Radio on Oct 30th at 6:00Pm to catch me talking about my journey to get to where I am today. I will also be sharing some new music with you guys. Thank you for all of your support so far, this is just the beggining. 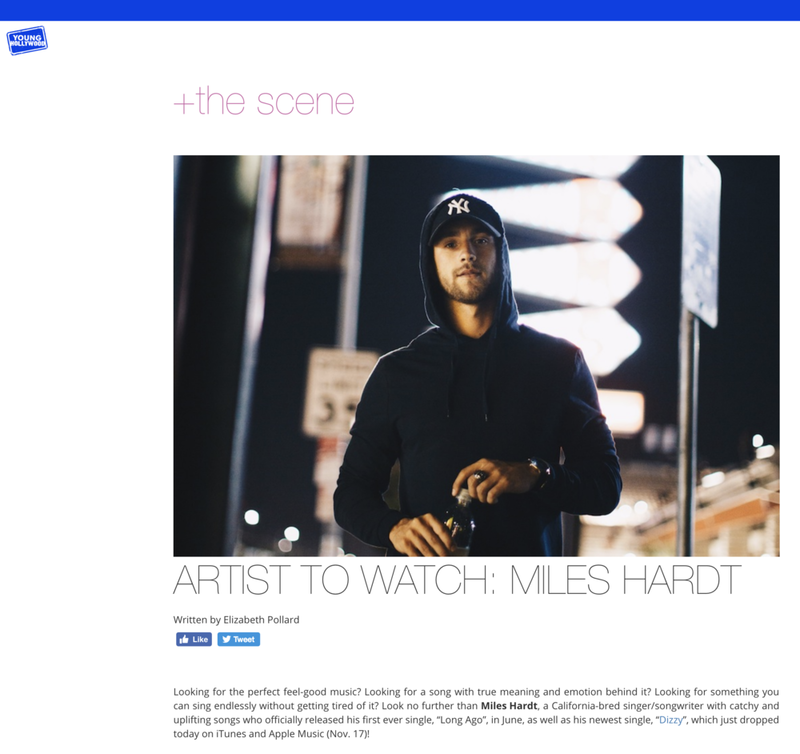 Miles Hardt, a singer songwriter from Los Angeles, California, released his debut single "Long Ago" in June. Today, he's released the accompanying visual that you can watch here first. Growing up around his father's recording studio in the Sound City Studios compound, Miles learned quickly that music was something he was going to pursue. "It's kind of hard to come by studios like that now where every single room is recording music at the highest level," he told me. "I think walking around there and watching artists retool their songs was something you couldn't not get obsessed with." I asked him if he had any pivotal memories of his experiences in the studios, to which he replied "I was fiddling around with a guitar in the front where everybody would have lunch and Jackie Jackson from the Jackson 5 came over and he took the guitar from me and showed me how to play a couple of different chords I hadn't played before. I told him I wanted to write songs… I didn't really know what level he was at because I was so young, but just him telling me that if I kept writing that it was like a tool that eventually it would get sharp and I could write songs people would connect to." When he describes the experience of spending his days in such a revered place, it's apparent that he's been raised on a steady diet of music education from a young age. Despite having a father in the industry and a mother who saw the potential pitfalls that befell those around them, his family remained supportive throughout his pursuits. In fact, it was a harrowing event for the family that made him confident he could follow the path he wanted. "The night that came my mom came home from watching her best friend die and feeling the pain in the house. My mom didn't really cry much and I saw her cry for one of the first times. " Rather than giving in to the tragedy, Miles snapped in to action and wrote his mom a song. "In that moment, I knew it was a weapon that I could use to get through all the hard things life throws at you… That was when I realized how powerful a song could be." And he's used the power of music to get where he is today: rather than crumbling underneath pressures that come his way or submitting to substances or distractions, he leans into music and its medicinal qualities. "My goal in my music would be to say that art and creativity and a different form of expression can take the place of these over the counter medicines and drinking and smoking: it's what kept me away from those things when I was battling my first severe depression. Music was like… Everyone has something that gets them through and that was the one thing that kept me above water. "Long Ago" wasn't a song I wrote for fame or accolades- I really was just a kid in my room trying to get over something I had never dealt with before and then all of a sudden, there's this catchy tune that made me happy. And instead of taking some pharmaceutical drug that makes you happy, something I created out of nothing made me happy, and there's something to that. I think art is a medicine if it's used right… If I stop writing, something's wrong."